Jackpot Cleopatras Gold Progressive Jackpot Slot - Casino Answers! Jackpot Cleopatra’s Gold is a 5-reel, 25-line progressive jackpot video slot developed by Realtime Gaming, featuring a wild symbol, scatter wins, multipliers, a free spins feature and a progressive jackpot. You can play the Jackpot Cleopatra’s Gold Real-Series Video Slot at Bovada. Bets on the Jackpot Cleopatra’s Gold slot machine are fixed at $1 per spin – or $0.04 per line. You must play all 25 lines at all times. It is a great video slot for casual players and with a progressive jackpot such as the one on Jackpot Cleopatra’s Gold, high rollers will enjoy it as well. If you want to speed up the game play, there is a Turbo Play mode available in the autoplay options. You can manually skill stop the reels by hitting the “Stop” button in mid-spin. To play the Jackpot Cleopatra’s Gold video slot, press the “Spin” button. At the time of this writing, the progressive jackpot on Jackpot Cleopatra’s Gold is at a monstrous $106,640 and rising at an extremely rapid pace. 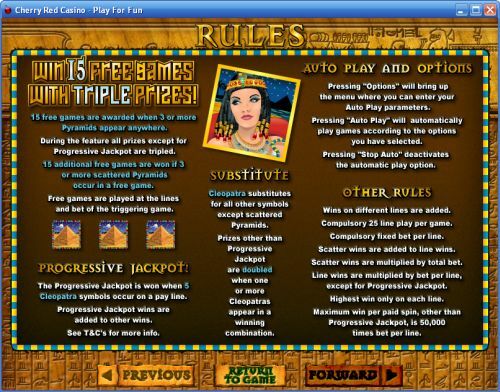 You can win this progressive jackpot by landing 5 Cleopatra symbols on a payline. The Cleopatra symbol is wild and will substitute for all other symbols except for Scattered Pyramids. Prizes other than the Progressive Jackpot are doubled when one or more Cleopatra symbols appear in a winning combination. You can win the Jackpot Cleopatra’s Gold Progressive Jackpot by playing for real money at Bovada! The Pyramid is the Jackpot Cleopatra’s Gold scatter symbol. 2, 3, 4 or 5 Scattered Pyramids anywhere on the reels will pay out 2X, 5X, 20X or 500X your total bet. When 3 or more Scattered Pyramid symbols appear anywhere on Jackpot Cleopatra’s Gold, you will win 15 free spins with a 3X multiplier. 15 additional free spins are won if 3 or more Scattered Pyramids show up during the free spins feature. Free spins are played at the lines and bet of the triggering game. Hit the “Autoplay” button to open the autoplay settings. You will be able to set the number of spins, set it to stop when the jackpot is won, stop if a win exceeds or equals (any amount you input), stop on any win, stop if your balance increases/decreases by any amount you input and stop once the feature is triggered. You can stop the Jackpot Cleopatra’s Gold autoplay mode using the “Stop Auto” button to deactivate it. Jackpot Cleopatra’s Gold amps up the regular Cleopatra’s Gold in a big way. Not only is an inexpensive progressive jackpot video slot, but the progressive jackpot is also quite large. A single $1 bet can win you a six-figure win! In addition to that, it maintains all of the greatness from the original Cleopatra’s Gold slot game. You can play the Jackpot Cleopatra’s Gold video slot when you sign up and make a deposit at Bovada! Can American players play the Jackpot Cleopatra’s Gold online slot for real money? Yes, players who are based in the United States of America can play the Jackpot Cleopatra’s Gold video slot and possibly win the Jackpot Cleopatra’s Gold progressive jackpot! You can play this excellent video slot at Bovada. Can I play a free Flash game of the Jackpot Cleopatra’s Gold video slot? You can play the regular version of Cleopatra’s Gold for free in your browser at Bovada. You can also play for real money. If you experience any difficulties with the Instant Play casino, make sure you have the latest version of Adobe Flash Player installed on your computer. Where can I read more progressive jackpot slot reviews? If you wish to read about more of the many progressive jackpot slots around, please read our list of progressive jackpot slots. 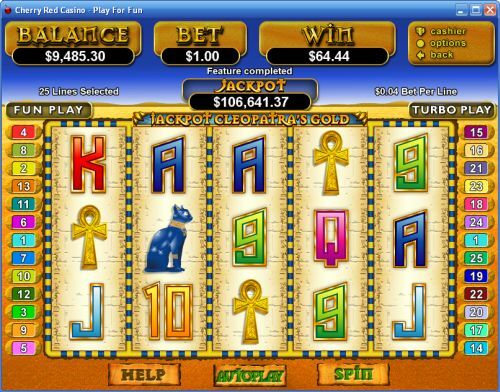 If you want to read more Egyptian-themed slot game reviews, please read our complete list of Egyptian slots. What are the differences between the versions of Cleopatra’s Gold? Jackpot Cleopatra’s Gold is a 25-line video slot, while the regular version is a 20-line video slot. The Jackpot edition of the game has a fixed bet of $1 per spin, whereas you can change the number of lines as well as your bet per line on the regular version of Cleopatra’s Gold. Jackpot Cleopatra’s Gold also has a much higher progressive jackpot. You can also read our Cleopatra’s Gold Video Slot Review for more information.